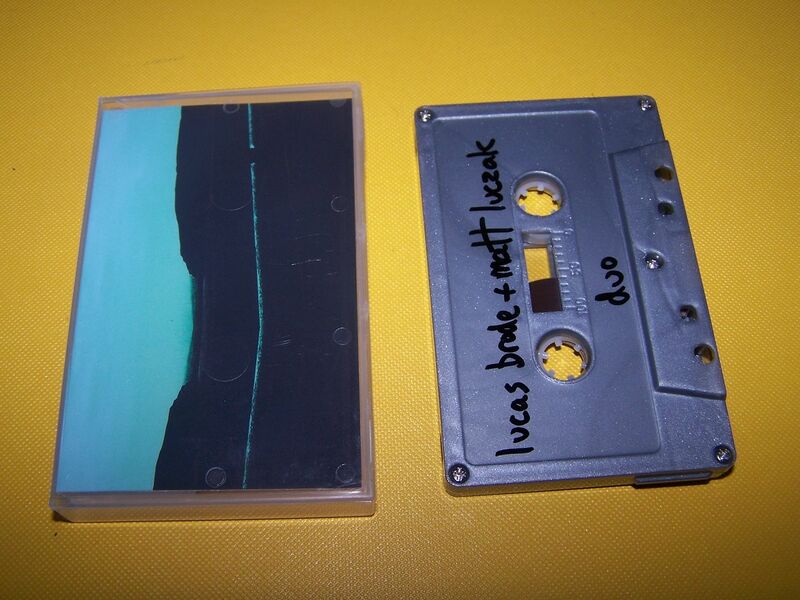 Raised by Gypsies ::: Cassette Review: Lucas Brode + Matt Luczak "Duo"
Cassette Review: Lucas Brode + Matt Luczak "Duo"
One of my first thoughts when listening to this cassette by Lucas Brode + Matt Luczak is that it reminds me a bit of the Pearl Jam song "Yellow Ledbetter". I heard a story once about how that particular song came to be just by members of Pearl Jam playing around together but not having any intention of making an actual song. 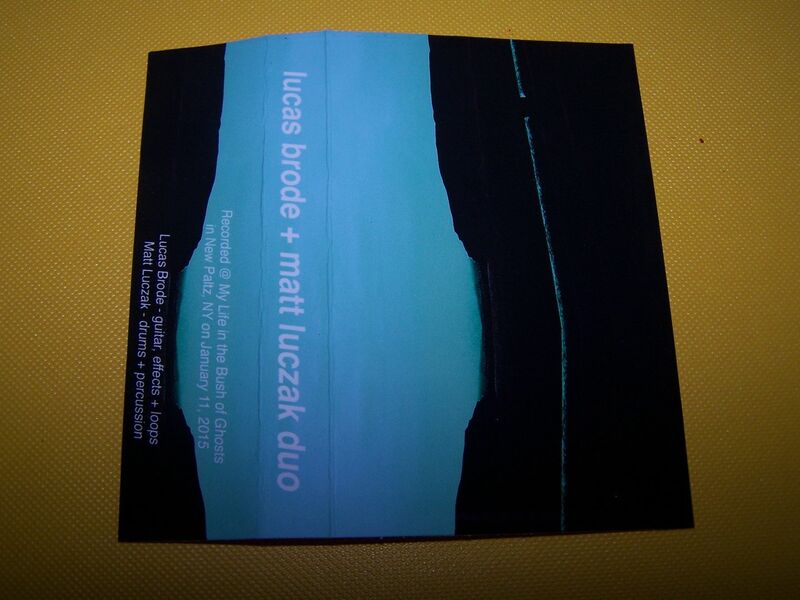 I'm not implying that the music of Lucas Brode + Matt Luczak doesn't feel like it has song structures, but it just has that improvised feel to it and for most of the first side at least I can't help but think of that part of "Yellow Ledbetter"- towards the end- and how it sort of goes "doot doo doo". If you've heard the song as many times as me it'll make sense to you, but if not it's not that important to appreciating this music. 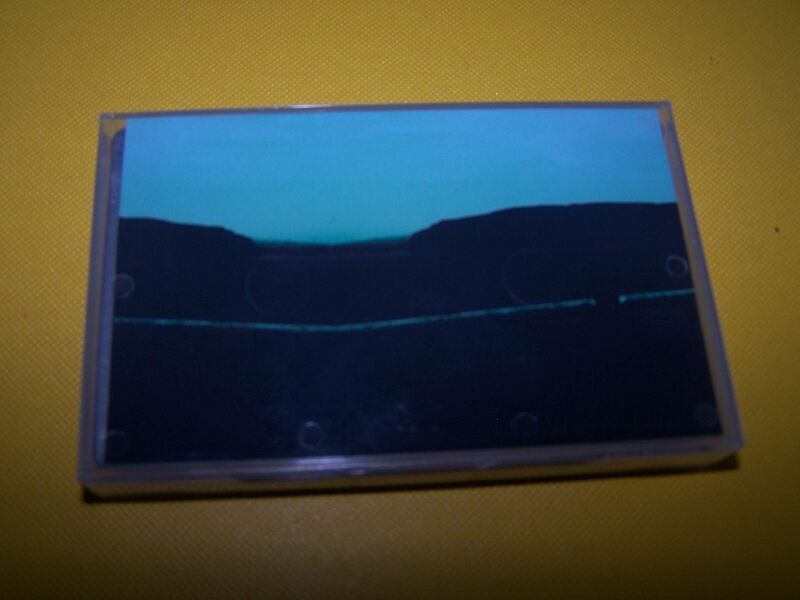 The first sounds you'll hear on this cassette are strings, drums and some static. The music comes out in random bursts and though these elements are presents and the drums do manage to keep a certain rhythm there just seems to be no rhyme or reason as to what is going on. It feels random, which is fine, but then it also has this sense of being incomplete. For the first half or so of Side A the music you will hear doesn't sound like any complete song but rather just fragments which somehow when listened to on the whole can somehow make some sort of actual song. But song structure has never been something I've looked for in music anyway, and I almost feel like it doesn't matter here because even something as distant from this as Gatsbys American Dream doesn't use the chorus. When I was back in my teens I used to mess around on my guitar a lot and I remember there was this movie called "Permanent Record" with Keanu Reeves. Basically, Keanu's character played music with this other kid and eventually Keanu killed himself by jumping off a cliff and then the rest of the movie was that unknown actor going through the emotions afterwards. In one scene though, Keanu plays all of these notes on his guitar and just shreds it. The other kid goes, "Yeah, do that again" and Keanu's character says, "I can't. I don't know what I did". I used to do a lot of that on my guitar as a teenager and this has that sound to it at times as well. Elements of R2D2 can be heard in here as well but he comes through with backing music to have him in full out rock mode and not his normal side of taking lead. The guitars slow down to this sort of drawl on Side A and that's when the true song structures begin coming out- if only to show you that they can do it- and through steady drumming this has a bit of an improv jazz feel to it. 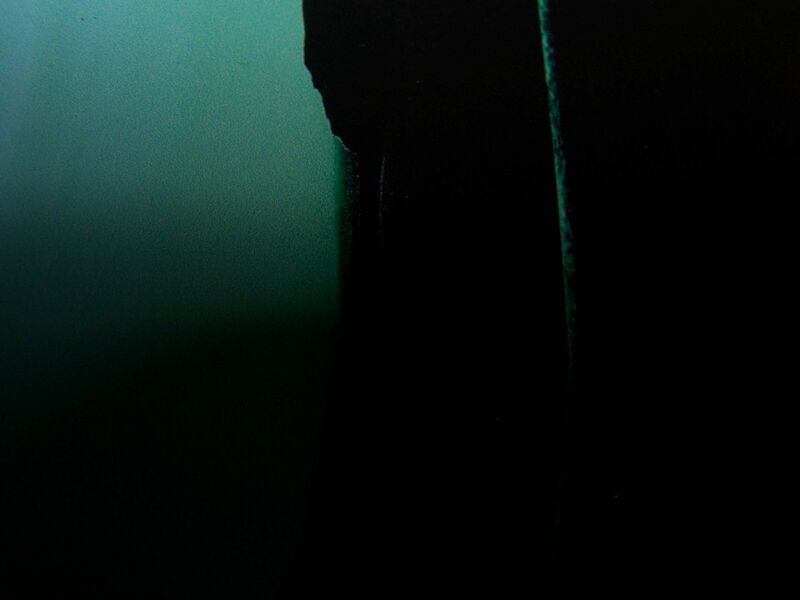 Side B takes us right back to the frantic woo-woo guitars and then there is also a plugging-into-an-amp sound as well. Throughout Side B it has a similar feel to Side A where it doesn't come until the second half or so that you can hear what could be considered traditional songs but that's okay. 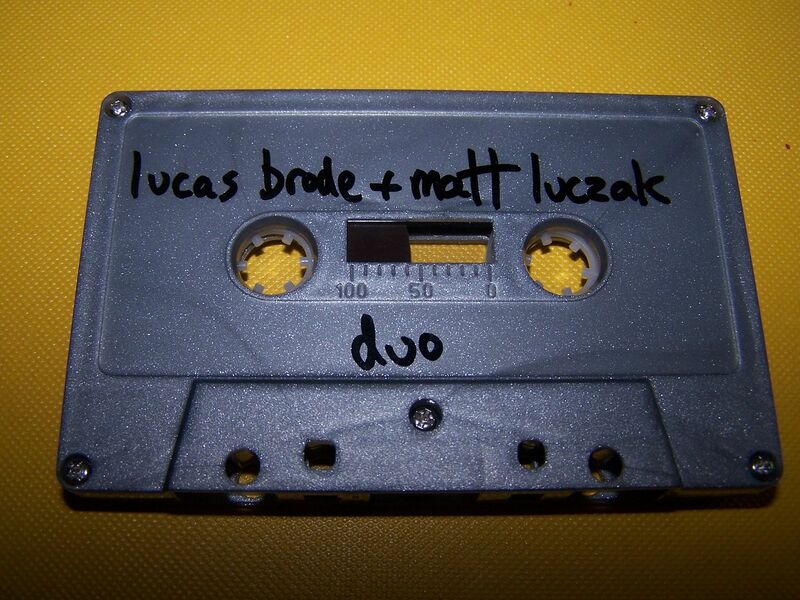 Guitars bring out something between "90210" and wandering the desert and, again, I feel like Lucas Brode + Matt Luczak are just kind of doing this in a way to taunt people who might think they can't write songs or feel like the music perhaps otherwise is missing something. But for me, this isn't missing anything and in all fairness I like the ideas of the guitars in the final minutes of the cassette, sure, but I prefer the sounds leading up to that because it just feels more random and in that way more genuine. You know, if you are just out there playing how you play then it gives the sound this unique quality that makes it your own. It's hard to compare this with anything else and that's why I think I like it so much because it just feels so personal to Lucase Brode + Matt Luczak where someone else could not recreate it.